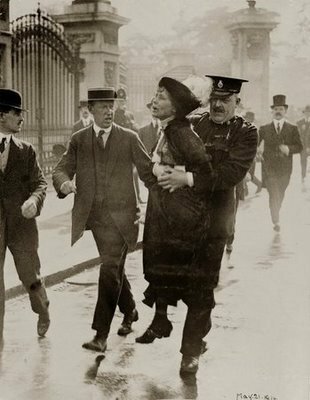 Emmaline Pankhurst arrested outside Buckingham Palace standing up for women's rights. Emmaline Pankhurst presents the king with petition for women's rights and gets arrested. Wallpaper and background images in the Feminism club tagged: feminism emmaline pankhurst women's rights suffrage buckingham palace. This Feminism photo contains baret hijau, pasukan khusus, tentara elit, green baret, prajurit elit, pakaian serdadu resimen, and regimentals. There might also be pakaian lapangan, pertempuran gaun, gaun seragam lengkap, berpakaian lengkap seragam, and penembak dgn senapan.